Thomas Jefferson turned over in his sleep. That document – they tore what I wrote apart. I must talk to Ben Franklin and John Adams. They have to persuade the Continental Congress to restore my original wording before the delegates sign it. The “Declaration of Independence” series brings to life the crafting and signing of the World famous document as told through the eyes of Thomas Jefferson, Samuel Adams, Benjamin Franklin, John Hancock, and Francis Lewis. Best- Selling author Murray Pura also includes recipes for Corn Bread and Colonial Braised Rabbit with “Volume 1 – Thomas Jefferson”. Fast Fact- There is something written on the back of the Declaration of Independence. There is a simple message, written upside-down across the bottom of the signed document: “Original Declaration of Independence dated 4th July 1776.” No one knows who exactly wrote this or when, but during the Revolutionary War years the parchment was frequently rolled up for transport. It’s thought that the text was added as a label. 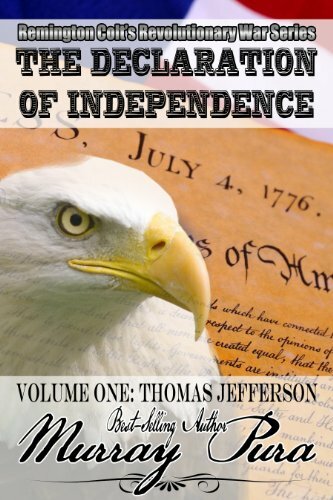 Murray Pura gives a lot of history in this series about Thomas Jefferson. At times it was hard to read and it didn't keep me turning pages as I wanted it too. Yet I kept coming back, wanting to know more history that I hadn't thought about before. Everything was not so cut and dry as it seems today. It made me realize the struggle the Thomas Jefferson went through and that he wanted his opinions known. Yet he came to realize the country must come first. He had a strong character but he knew in his heart he should listen to others. It was the little descriptions here and there that made me feel like I was back in time. Somehow I could smell the pipes being smoked in the taverns, imagine the streets crowded with carriages, and the ships in the harbor. I have to admit I skipped over some parts including the bedroom scene talked about so much in the reviews on Amazon. After going back and rereading that part I'm going to say this as a great history read for adults! I was given this book by the author in exchange for a review.